A beautiful and meaningful Reform ceremony combines tradition with equality, binding the bride and the groom in the promises of marriage. The wedding ceremony contains B’ruchm Haba’im – Welcome; Birkat Erusin – a Betrothal Blessing; a ring ceremony; recitation of the Sheva B’rachot – the Seven Blessings; and the breaking of the glass. When the rings have been exchanged, the wine tasted, the blessings bestowed, and the glass broken, you become a family in Israel. Rabbi Weiss will perform wedding ceremonies for Jewish couples, along with Hazzanit Abrams, at home, in temple or at an appropriate event facility. Please contact Jaye at the temple office (Ext. 108) to set up a meeting with Rabbi Weiss if you are interested in booking a wedding. At your first meeting with the Rabbi, he will give you a copy of Temple Har Zion’s Wedding Manual. Please be sure to book the Rabbi before booking the venue! 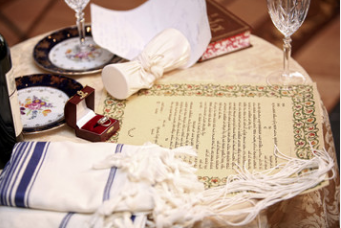 A ketubah is required for all Jewish weddings. The temple will provide one or you may purchase your own. The wording in the ketubah must reflect that which is established by the authority of the Reform Beit Din – the Rabbinical Court – of Toronto.